Yesterday, we reviewed Synology’s DS411j Synology DS411j NAS Review and Giveaway Synology DS411j NAS Review and Giveaway Read More and were greatly impressed by its intuitive GUI. And while the DS411j is mostly geared towards average home users, the NAS device that we will be looking at today is targeted at power users who demand higher performance over ease-of-use. Netgear’s ReadyNAS Ultra 4 is available in both diskless ($699.99) and 2 x 2 TB ($999.99) configurations. 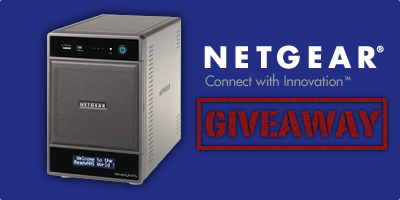 We received a diskless unit from Netgear and will be taking a closer look at almost every aspect of the NAS shortly. We’ll also be giving away the review unit so stick around. At $699.99 for the diskless unit, it’s exactly the same price as Data Robotic’s Drobo FS. And even though the Drobo FS can accommodate 5 disks as opposed to the ReadyNAS Ultra 4’s four disk array, the ReadyNAS has several features pulling it ahead. Even though the ReadyNAS Ultra 4 is the slimmest of all the NAS devices featured in this mega giveaway, it is also the heaviest — weight at 10.35 lbs (almost 5 kg) without any disks installed. Its weight is mainly attributed to its solid metal construction. At the front, you’ll find the usual suspects: a power button, and several activity indicator lights, a USB port and backup button, a backup status light, a metal grill and finally, a OLED panel display at the bottom. The front metal grill swings open to reveal the 4 hot-swappable drive array (max 8 TB) and drive trays that lock into place via a latch. This allows for easy access to drives without any tools required other than a screwdriver to attach the drive onto the metal drive tray. The very first thing you’ll notice at the back is a large metal handle. I assume they had to include it because the ReadyNAS Ultra 4 is just so darn heavy. There are 2 USB 2.0 ports which can be connected to UPS devices, printers, etc (no eSATA interfaces to be found), a system reset button, 2 gigabit ethernet ports, a fan grill, a power inlet and Kensington lock port. If you’re wondering why it has 2 ethernet ports, I’ll try my best to explain without introducing too much jargon. In most NAS devices that feature 2 ethernet ports, they can be teamed together resulting in one connection to the router. This increases the link speed beyond the limits of a single, regular connection and also provides redundancy in case a connection fails. However, the ReadyNAS Ultra 4 does not have this feature. Instead, the 2 ethernet ports allow you to connect to 2 different subnet groups so that the NAS can be accessed from 2 different locations. Utimately, if you’re a home user, you’ll most likely only be using one of the 2 network interfaces. The ReadyNAS Ultra 4 features a 1.6 GHz Intel Atom single-core with 1 GB DDR SODIMM upgradeable memory. Installation of the ReadyNAS Ultra 4 involves plugging the power and network cable into the device and powering it on. The NAS will automatically negotiate for an IP address. Before you can start using it though, you will have to configure the device like we did in the previous reviews. Netgear provides a desktop utility cleverly named RAIDar. Once the NAS obtains an IP address, RAIDar will automatically detect it. On initial setup, you’ll have the option to choose between Netgear’s X-RAID2 (comparable to Synology’s Hybrid RAID and Drobo’s BeyondRAID technology) which provides single disk redundancy and auto-expanding RAID capabilities; or you could manually configure it to RAID levels 0, 1, or 5. It does not support non-RAID configurations like JBOD. The ReadyNAS Ultra 4 accessible, hot-swappable front drive array coupled with X-RAID2 technology makes it pretty easy to upgrade. While the system is powered on, remove the lowest capacity drive for a larger one and wait for the data to redistribute. Depending on the amount of data stored, the redistribution process could take up to 10 hours and is indicated by the front OLED display. Allow that to complete before swapping another drive from the array because X-RAID2 only provides 1 disk redundancy. Luckily, the process transparent so you can go about using the NAS simultaneously. Like most Netgear products, the ReadyNAS Ultra 4 is managed via a web interface. Unfortunately, it utilises an archaic frames interface as opposed to an AJAX GUI like the one used by Synology. As a result, jumping back and forth between settings isn’t easy. The lack of a GUI also means that it is quite unintuitive. The ReadyNAS Ultra 4 doesn’t come installed with much. You’ll get a DLNA media streamer, TiVo support, power scheduler, support for external USB hard drives, printers and webcams, UPS support, among others. But where the ReadyNAS really shines is its backup functionality. 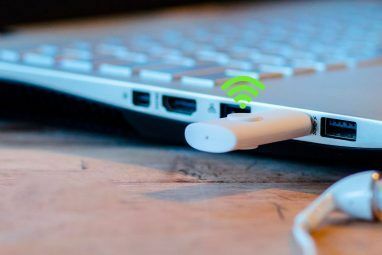 This device is able to backup to and from almost anywhere. You could backup any folder from a computer, enable Time Machine on Apple computers or using the Backup button on the ReadyNAS unit. It is also capable of backing up to attached USB drives, networked shares and other ReadyNAS devices on the network. Every ReadyNAS Ultra 4 also comes 2 GB of ReadyNAS Vault Online Backup, free for 2 years. The ReadyNAS Ultra 4 may not be for everyone, especially considering the fact that it isn’t easy to manage. However, once you have the system up and running, it’s pretty rewarding. The ReadyNAS Ultra 4 beat most of the home/prosumer NAS devices on the market with its astounding throughput performance, as shown in a CNET review. Plus, it comes with a 3-year warranty. MakeUseOf would like to thank Netgear for their generosity. Interesting in sponsoring? We’d love to hear from you. Get in touch with us via email. I tweeted, liked the fb page and signed the form......My husband and I have been wanting to get one of these for almost a year now. I'd love to have this!! I actually really, really NEED it. Here's hoping I get one. These look like they are awesome. What a great device to have...count me in! Just finished signing up. Count me in! Geez, Netgear make their gear so simple to set up and use.. This has to be the most smartest and efficient storage device thats ideal for businesses of all sizes or people who keep photographs and videos.. Liked and Tweet'd, love the Netgear, but wouldn't mind any of them, they all have huge storage to store your Videos, pictures etc. Being disabled I spend a lot of time on my Pc so this would really come in handy, so just hope I can get my hands on one of them, Cheers for the chance. YEAH!!! I hope I get this one! !